THE children at Ballybrown NS were giddy in the schoolyard, dancing and jumping with dozens of small, handmade torches and little Irish flags. 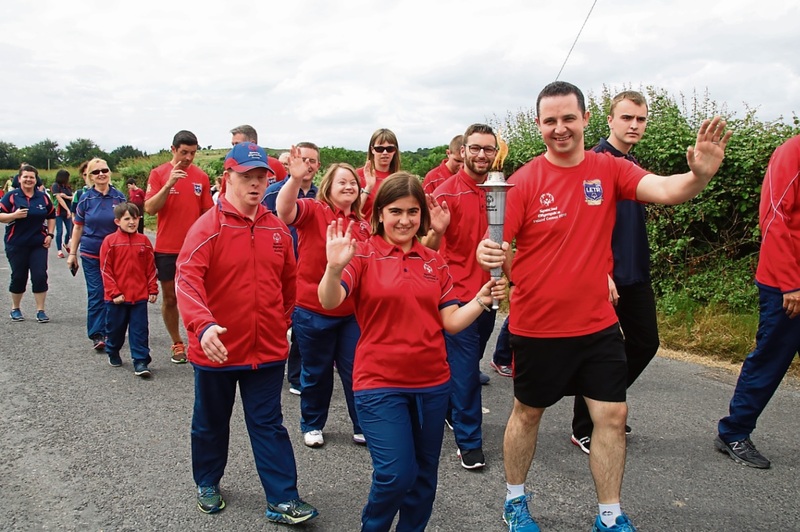 They were waiting for the Flame of Hope, carried with pride by Special Olympics team members, who will take centre stage this weekend at the Ireland Games. The Law Enforcement Torch Run, a joint effort between Special Olympics Ireland and An Garda Síochána, stopped off in the local primary school, as it makes its way to Dublin for the games. While the children waited, Journey’s Don’t Stop Believin’ reverberated across the schoolyard; an apt song for a day that was all about celebrating success through adversity. Droves of parents, babies and playschool pupils were also there, in high spirits for the event. And amid all the excitement, the real torch arrived, marched up the road by the athletes and ambassadors, to the booming sounds of the City of Limerick Pipe Band. Limerick’s own Anna Potter, a Special Olympics athlete, and garda Paul Howard of Roxboro garda station, led the flame through the crowd. Perhaps one of Ireland’s most famous guards, dancing footballer Aidan O’Mahony, was also there. All-Star O’Mahony is a Kerry footballer and became a household name after winning the first season of Dancing with the Stars Ireland. And plenty of other stars from the world of sport also attended the school on Monday. Past pupil Paudie O’Connor, a footballer at Leeds United, posed for photographs with soccer fans in his home village. For captain of the Irish women’s rugby team, Ciara Griffin, the visit was a return to the school, where she taught some months ago. And Adare’s Declan Hannon, captain of the Limerick hurlers, was happy to meet and greet just one day after Limerick’s stunning victory over Waterford. Local TDs Niall Collins, Patrick O’Donovan and Tom Neville were there, as well as Limerick’s metropolitan mayor, Cllr Sean Lynch. One of the stars of the show, though, was little Oran Cantillon Mann, a pupil at Ballybrown NS and Special Olympics athlete. Amid the singing and dancing, a cheer broke out among his schoolmates — “Oran! Oran! Oran! Oran!” — and gathered momentum until there was a loud, proud hurrah for the young athlete. The Special Olympics Ireland Games run from June 14 to 17 in Dublin.